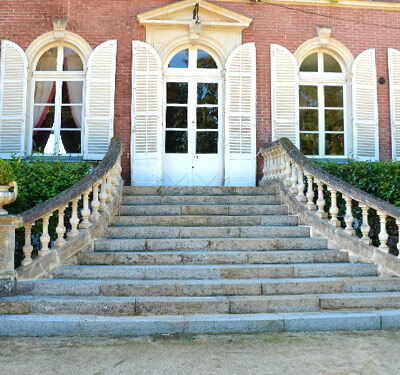 The Château de La Caillotière, whose name comes from the many quails that used to be hunted on the estate, was built more than 200 years ago by the French ambassador Augustin de Vernouillet, ancestor of the present owner. The house is a testimony to elegance and charm with its facades of pink bricks and Tuffeau, the white stone of the Loire Valley used for most of the valley’s many chateaux, and the superbly crafted ironwork of the front stairs and balcony. It is set in a park of over 70 acres, with a “jardin à la française” at the front of the house sloping gently toward a pond, an Arboretum of approximately 250 rare species of bushes and small trees chosen for their spectacular flowers, a walled kitchen garden in which the gardener grows flowers that guests are welcome to pick, a new tennis court and a heated swimming-pool.